Richard is an award-winning writer and hockey coach/mentor. 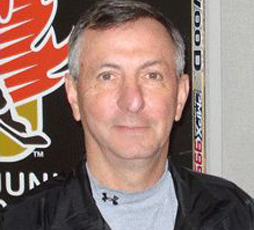 The former Director of Coaching for Hockey Eastern Ontario, he's a Hockey Canada Master Facilitator/Mentor and coaching evaluator. He's worked with teams from minor to junior to university to Europe and also Canada's Program of Excellence. He's been a newspaper and magazine columnist and has authored two books, one of which is the recently released coaching manual Inside Coaching Hockey. It's available from his web site richardbercuson.ca. He spends inordinate amounts of time running to and from rinks and to finish lines as a runner of various ridiculous distances. He likes cheesecake, dry red wine, and long walks on a hot beach. One of those is not readily available where he lives. Deflections - Process? Or Product? So, how’d it go? To which the respondent, a perfectly typical minor hockey coach who, like nearly all of them, has his heart in the right place, says, “Pretty good. We got into the finals of two tournaments. Deflections - Behold, the trainer! Hockey team trainers are overworked and under-appreciated. We say thanks at the end of a season though I wonder how many coaches realize just what these people have been doing all year. Cross-ice is on the horizon for every five- to eight-year-old in the country. Initiation Program (IP) next year; novice the year after. The axiom says, “Everything is easy before it becomes hard.” Any coach will agree that when you teach something new, players may find it challenging, even hard. In a country where any minute change to our beloved game is looked upon with suspicion, Hockey Canada’s recent pronouncement that cross ice games are now to be mandated in the Initiation Program would seem to be grounds for a parliamentary investigation. Time for a debrief into the mirror. What did you learn from this season? You can choose to criticize the parental groups or bemoan the fact your players couldn’t turn both ways. Deflections - Interviews: Be Ready! Some years ago, I assisted in the creation of a document to outline the selection process for elite coaches in a minor hockey district. A major part of that process involved the interviews. Reading will make us smarter, or so went the mantra of one of my teachers in a Montreal private school. It came on the heels of our whining about having to read three novels each summer then return in September to write book reports on each one. Deflections - What do parents say? Is what parents say about the coach important? Deflections - The ladder to… where? How do you know when it’s the right time to aspire to coach at a higher level? First, consider the definition of higher level. In the minds of some, a higher level simply means older players. In the European club model system, the best technical coaches work with the younger children. Yes, yes, I know, today is Valentine’s Day, so I’m sending some hockey love…However much fun it was as a kid to be in the room with buddies, it’s no different with coaching staffs. In their exuberance to provide players nearly the entire hockey curriculum in one season, coaches frequently jam a host of drills into a practice. Minor hockey would effectively eliminate many parental complaints if it created a rule whereby shifts were determined by the clock. One minute or two minutes or whatever – buzzer! – change lines. Novice, bantam, house or AAA. Guaranteed equal ice for everyone. Simple.